The Salmon Safe Projects at Mt. Hood Community College are a series of projects that improve wild salmon habitat and water quality. This project is a partnership between the Sandy River Watershed Council, MHCC, and other regional partners. Photo Credit: MHCC Marketing – Partners tour the Salmon Safe construction site Aug. 2018. Beaver Creek, the lowermost tributary to the Sandy River, and its tributary Kelly Creek, flow through and meet on MHCC campus. These creeks support populations of wild salmon and steelhead, despite urban and agricultural development in the Beaver Creek watershed. The creation of these goals and the implementation of projects and changes that support them has made MHCC the first community college in the country to earn the Salmon Safe certification. It is also the first institution to gain the designation in Gresham. View of Kelly Creek from the MHCC Nature Trail. Beginning in 1965, construction of the MHCC campus transformed a former agricultural area into the current campus, which includes 57 acres of impervious surface. 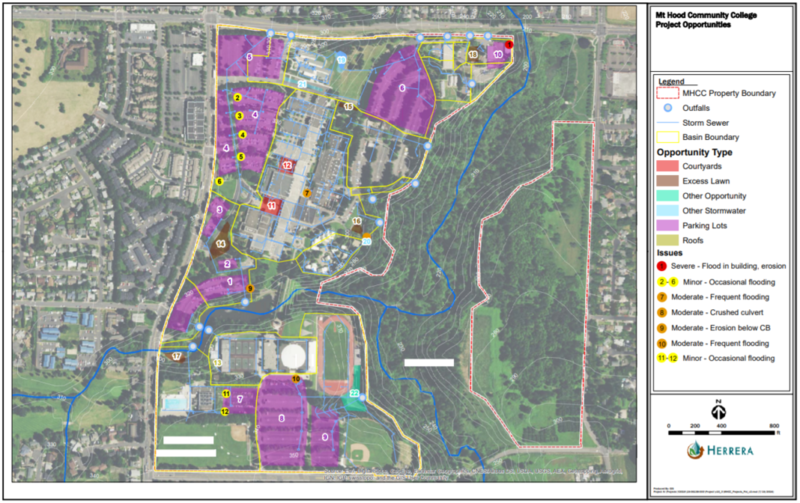 The 1960’s campus design did not take into consideration the impact of stormwater heating up and collecting pollution from parking lots, roofs, and other hardscapes as it flows untreated into habitat occupied by salmon in Beaver and Kelly Creeks. As a result, the MHCC campus drains 60 million gallons of polluted stormwater to the creeks annually, degrading water quality and fish habitat. Kelly Creek splits the north end and south end of campus. To make travel easier between the two ends of campus, a dam and causeway were built over the creek. The dam created the Kelly Creek pond, which is managed as a recreational fishing resource. The pond heats up water temperature downstream of the dam by four degrees Celsius in the summer. This raises the temperature above what a normal juvenile salmon can survive in. Partners are conducting a study to see if it is possible to change the dam to improve water quality and habitat for salmon. 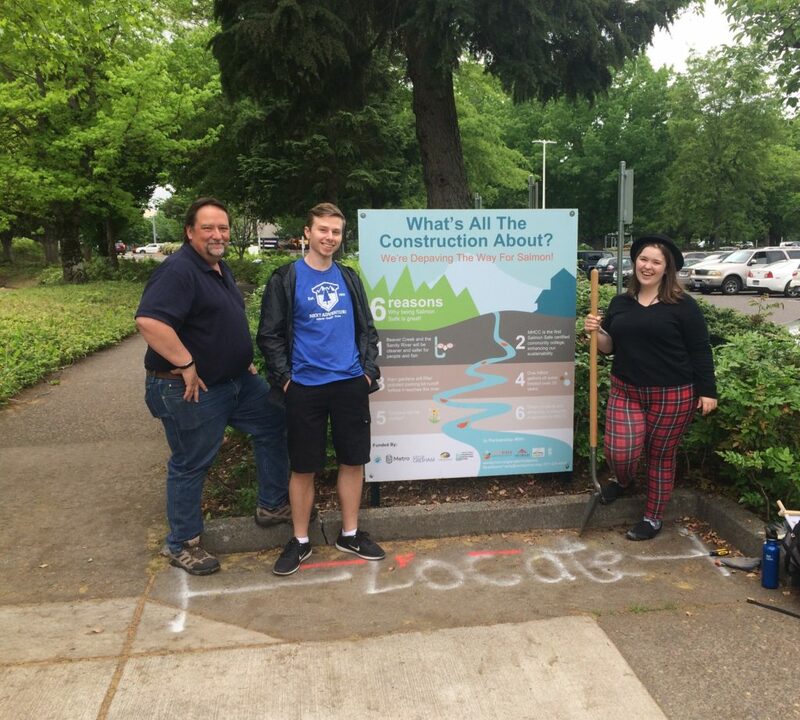 East Multnomah Soil and Water Conservation District funded an opportunity analysis of the MHCC campus in the spring of 2017. The consultants performing the analysis, Herrera Environmental Consultants, identified 22 different project opportunities. Partners prioritized opportunities based on a series of impacts: volume of stormwater treated, improvements to habitat and tree canopy, cost, opportunity for student and public involvement, and long-term sustainability. The first Salmon Safe project kicked off in May 2018. With the guidance of non profit Depave 130 volunteers helped remove asphalt from seven spaces in MHCC's front parking lots to absorb rain water and give large older trees room to grow. These spaces were planted, again with volunteer help, in the Fall of 2018. To read more about the Depave for Salmon project go here. Also, during the summer of 2018, rain gardens, bioswales, and planters were constructed in two parking lots. This project alone will treat nearly 2 million gallons of stormwater a year. 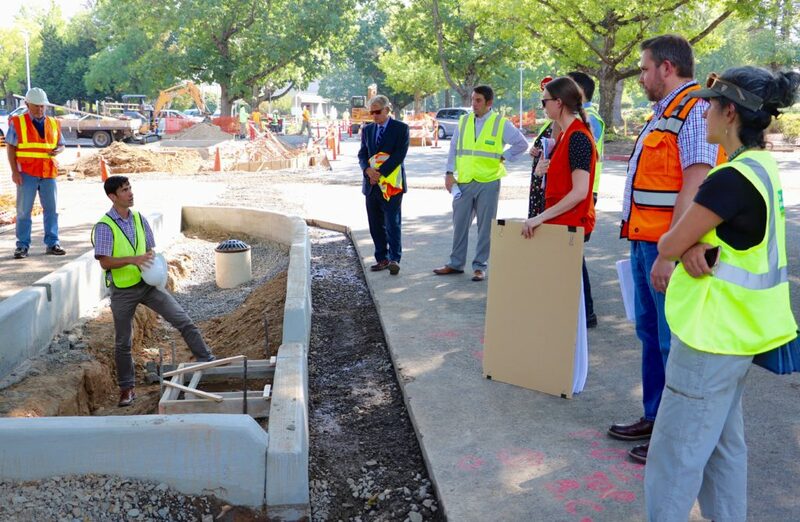 Timelapse video of rain garden construction in MHCC parking lot F.
Project partners will continue to work together to complete additional projects as plans are completed and funding is available. Monitoring gauges installed in drainage pipes will track water volume, quality and other indicators as stormwater retrofits occur. The Salmon Safe projects are a collaborative effort between MHCC, the Sandy River Watershed Council and a range of regional partners. The Salmon Safe Clean Water project is funded entirely by external grants from: East Multnomah Soil and Water Conservation District, Metro, City of Gresham, Spirit Mountain Community Fund, and the Oregon Department of Environmental Quality. During their spawning surveys, on Beaver Creek, MHCC fisheries students often find that salmon die before they can lay their eggs. This may be because the salmon return in the fall when the rains begin again. The first fall rains wash all the pollution that accumulates on the roads and parking lots during the dry summer into the creek, at the same time as salmon are returning from the ocean, which may be enough to kill the salmon after their long journey. The Clean Water Retrofit rain gardens and other stormwater management projects will help reduce pollution and stream temperature . Beaver Creek's salmon will have a healthier habitat where they can lay their eggs, and once hatched their young will have a better chance to survive, migrate to the ocean, and repeat the life cycle. With all priority actions completed, the MHCC Salmon Safe project's goal is to clean, cool and capture a billion gallons of runoff over the thirty-year project life. Improved passage via culvert projects nearby will help the salmon return upstream to spawn. 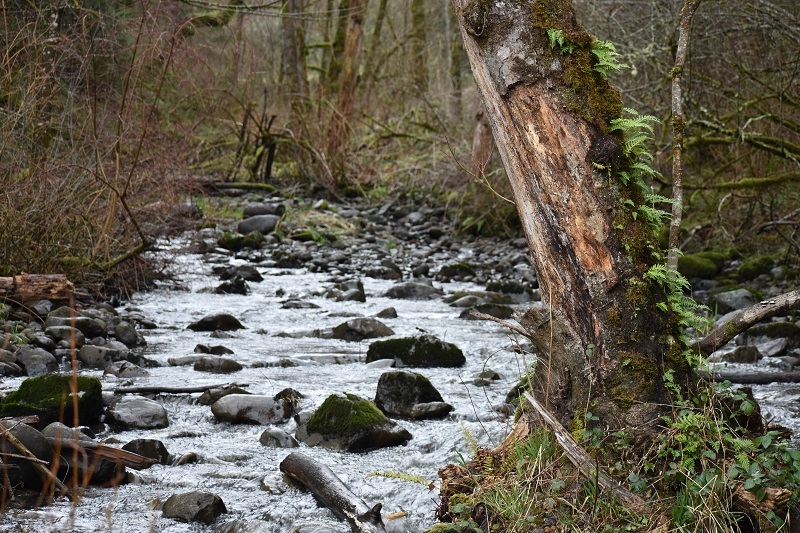 Little by little, Salmon Safe project partners, with the help and support of the community, hope to restore Beaver and Kelly Creeks to healthy habitat where many species of native fish and wildlife can thrive. 30 different MHCC classes have participated in the project so far in various ways including: developing signage, conducting spawning surveys, and evaluating the project design. In the future students will be able to analyze water quality data from before and after project completion. MHCC Integrated media students designed informational signs about the Salmon Safe project construction. Other efforts happening around campus to improve conditions for salmon include the replacement of fish passage inhibiting culverts near campus. Culverts allow streams to flow under a road, but often cause erosion problems that make it difficult for fish to get upstream. In 2017, Multnomah County replaced the culvert on Beaver Creek at Stark St. In 2018, the City of Gresham replaced the culvert on Kelly Creek at Kane Dr. that had blown out during a record breaking 100-year storm December 2015. 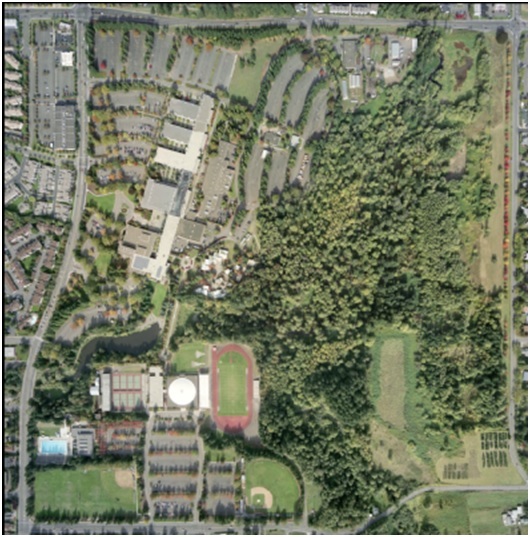 In 2019, Multnomah County will replace the culvert at the south end of campus on Beaver Creek under Cochran Rd. New Multnomah County culvert with natural stream bottom at Stark St. The following are resources and articles about the MHCC Salmon Safe Projects.